Children are our greatest treasures! Sacred Heart Early Learning Center in Conroe, TX understands you want the very best child care for your infant to pre-schooler. Our early childhood education center provides a secure, loving, Christ-centered environment for your child, one that will promote a bright start to life, and a life-long love for learning. "growth and stimulation of the whole child: mind, spirit and heart"
Sacred Heart Early Learning Center is devoted to the unique needs of early childhood development. Our mission is to provide a developmentally child- focused learning experience for each student in a Christ centered environment through curriculum that supports the growth and stimulation of the whole child: mind, spirit, and heart. or School Day 7:45 a.m. to 3:00 p.m.
School Uniform: Students are not required to wear a uniform; appropriate seasonal clothing is permitted for Sacred Heart ELC students. No open toe shoes or sandals are allowed. Lunch: Lunch and snacks must be provided from home. Sacred Heart ELC will serve a morning and afternoon snack for 18 months to 2 year olds. Items packed from home for student lunch will not be permitted to be heated or cooked. All foods/milk for infants will be provided and packed by parent daily with feeding instructions. ELC is a nut free facility due to nut allergies. Please do not send any nuts or peanuts. School Supplies: Nap mats will need to be provided by parent the first day of attendance for 18 months to 2-year-old class. The required mat is Three-Fold Rest Mat – 1" Thick (48" L x 21" W). Teachers will provide a school supply list for your child’s class the first week of school. School supplies will need to be submitted by the second week of child’s attendance to the child’s teacher. Sacred Heart Early Learning Center's curriculum provides an appropriate, comprehensive, developmental approach to early childhood education focused on children six weeks to two-years-old. Teachers are dedicated to fostering each child’s individual maturation through a structured play base approach while incorporating appropriate curriculum for core subjects (math, science, language arts). Programs such as Frog Street and Handwriting without Tears are used in combination with teacher chosen materials to enhance lessons taught in the classroom. Curriculum is composed of educator written lesson plans created and intertwined with age appropriate learning activities. Daily activities include daily prayer, center play, art, painting activities, block building, reading stories, interactive word walls, and outside play. 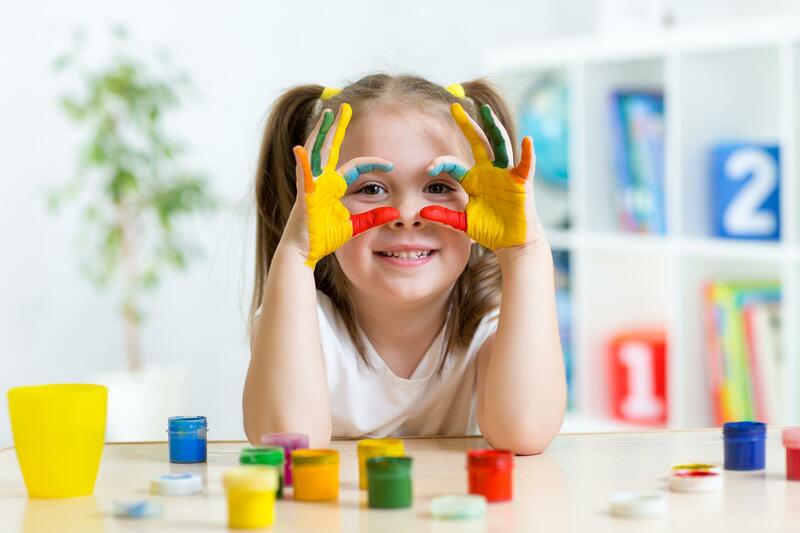 Advanced skills— focused on social interactions, problem solving resolution, and fine & gross motor coordination—are additionally taught in conjunction with art, physical education, and dramatic play. Sacred Heart Early Learning Center lays the foundation for continued success in education in and out of the classroom. To register, click on the download button below. Print out all pages. Fill in the entire form, and either mail to: SH Early Learning Center, 615 McDade Street, Conroe, TX 77301, or fax to 936-756-4097. This handbook contains everything you need to know about ELC school policies, procedures, and regulations designed to help your child grow spiritually, academically, socially and psychologically. Click on the button below to download the current 2018/2019 School Year Calendar. Please note ELC will close for two weeks July 29 - Aug 13. Your child's safety is our highest priority. All staff members have undergone extensive security training. In the event of an emergency, a crisis plan has been put into place covering a wide variety of possible situations. Click to read and download the plan. Please let us know any questions you may have. We're here to answer all of your concerns, and will get back to you just as quickly as possible. Thank you!